Lick the Sugar Habit. Enjoy Food’s Sweet Taste without Expanding Your Waist! 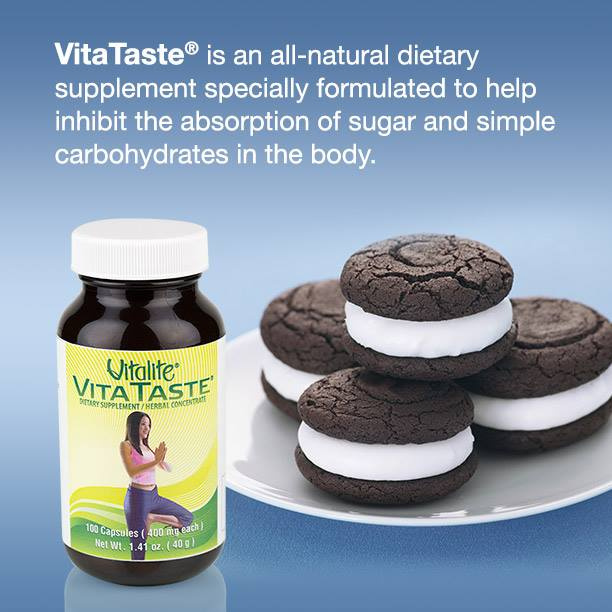 VitaTaste helps inhibit the absorption of sugar and simple carbohydrates (also called simple sugars) by the body. This effect is accomplished by blocking access to the receptors in the intestines that normally absorb or attach to sugars. By blocking these receptors, VitaTaste stops the absorption of sugar so that it can then be excreted by the body before being stored as fat. Inhibiting sugar from being absorbed lessens the amount of sugar that gets stored as fat, which promotes lean body mass—a “sweet” result we all want. By taking 2 capsules of VitaTaste before or with meals you help inhibit the absorption of sugars and simple carbs by the body. This is great for people who want to enjoy foods and beverages made with sugar, but who don't want all those carbs adding to their waistline. When you reduce the absorption of sugar, cravings for sugary foods and drinks decrease. When you begin to eliminate sugary items from your diet, you cut out many empty calories, a healthy step towards natural weight loss. VitaTaste is also full of antioxidants, which cleanse the body from the inside, protecting it from free radicals and assisting in the removal of fat and toxins. Proprietary blend: 425mg each capsule. Lycium fruit, Gymnema, Coix lacryma-jobi fruit, Sacred lotus seed, Sacred lotus rhizome, Lilium brownii bulb, imperata rhizome, and Foxnut. Vegetable based capsule. Lycium fruit (also known as goji berries) is an excellent source of body-cleansing antioxidants, such as polyphenols, flavonoids, carotenoids and Vitamins A, C, and E, plus it contains more than 30 essential and trace minerals. Gymnema is a plant known for its “sugar-blocking” property that reduces sugar absorption during digestion. When gymnemic acids lock into intestinal receptors, they effectively lock out glucose. Coix lacryma-jobi fruit is a rich source of antioxidants, which protect cells against the damaging effects of free radicals. And studies suggest that the fiber contained in coix fruit may help decrease how much fat and cholesterol the body absorbs. Lotus root is an excellent source of dietary fiber, which slows the digestion of complex carbohydrates. VitaTaste is based on the ability of certain plant substances to block the absorption of sugar. You can prove this to yourself by opening 1 VitaTaste capsule, rub the contents all over your tongue, hold it there for 1 minute, then rinse it down with water. For the next 1 to 2 hours you will not be able to taste sugar. Try a cookie, a piece of candy, or anything made with refined sugar and you will not be able to taste the sweetness. What you will taste is the unhealthy ingredients the sugar was hiding. The taste of other foods will not be affected. 2 capsules before or with meals so that the sugars and simple carbohydrates will not be metabolized into fat. 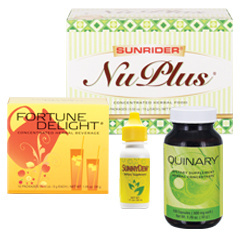 VitaTaste is good for those who want to lose weight. VitaTaste is also a natural way of dealing with addictions to tobacco or alcohol. Some research shows that “sugar-holics” and alcoholics are often suffering from the same craving, just at different levels. When liquor turns to sugar in the bloodstream it gives the user a temporary high. Most cigarettes are also made with sugar, in addition to other addictive components. Tobacco leaves are often soaked in sugar during processing. Placing the contents of 1 VitaTaste capsule on the tongue for one full minute and rinsing with water, curbs cigarette cravings for hours. When someone does smoke, the taste is unpleasant. VitaTaste may also benefit those who suffer from yeast disorders or candida because sugar is the primary source of energy for growth of yeast in the body. Vitalite VitaTaste is an all-natural herbal weight loss supplement that helps reduce the absorption of sugars. 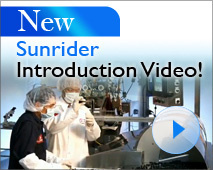 There is virtually nothing else on the marketplace to compare with this product. Please note: Any weight loss program should include exercise and a sensible diet with high-fiber, low-fat foods such as vegetables, fruit, lean white meats or fish.